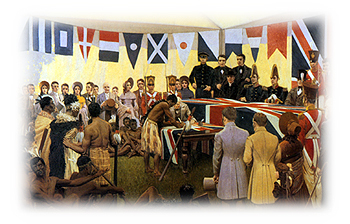 In New Zealand, paintings done in the early Nineteenth Century idealized the Maoris through an approach to the grandeur of their physiques, which drew its inspiration both from the classical approach to human form and from a romantic vision of individuals within their landscape. Theirs was again a romantic vision which had little relation to the social and economic reality of Maori life in the period. As white settlement developed in New Zealand in the 1840s, surveyors and explorers produced notable watercolours of New Zealand landscapes. These acted as practical aids to their survey of economic resources and as propaganda for the company and settlement opportunities. But they also showed the artists' fascination with the land around them. Artists soon developed an obsession with the stunning scenery of the west side of the South Island. As in Australia, the discovery of gold in New Zealand in 1861 produced a considerable quickening of both economic and artistic activity. 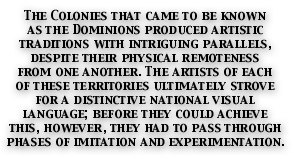 Enhanced commercial contact with the outside world brought more artists and European influences to the colony. Although much of their art was to remain allusive - likening the New Zealand landscape in turn to Scotland, Switzerland, Norway and California, artists struggled to find a local 'feel' for their paintings, particularly emphasizing the translucent light effects of the southern hemisphere adn the distinctive alternation of brightness and shade. By the end of the century, New Zealand artists, like their counterparts elsewhere, were leaving to be trained in Europe and among them - in a country that had female suffrage earlier than anywhere else in the empire - was a remarkable group of women artists.